Having your own company is tough and a lot of small business owners run a lean operation. They watch very carefully on what they spend their money. So it’s easy to see why almost half of the small businesses don’t have a website. Is a website a luxury item for your business and can you afford to live without? In our opinion, the only way to start promoting a business is by building a professional website. We mention in a previous article that your website gives your business credibility. Let’s look at another reason why is important to have a website for your business. Before you print a business card or spend any money on advertising, you need to start your marketing by creating a website. 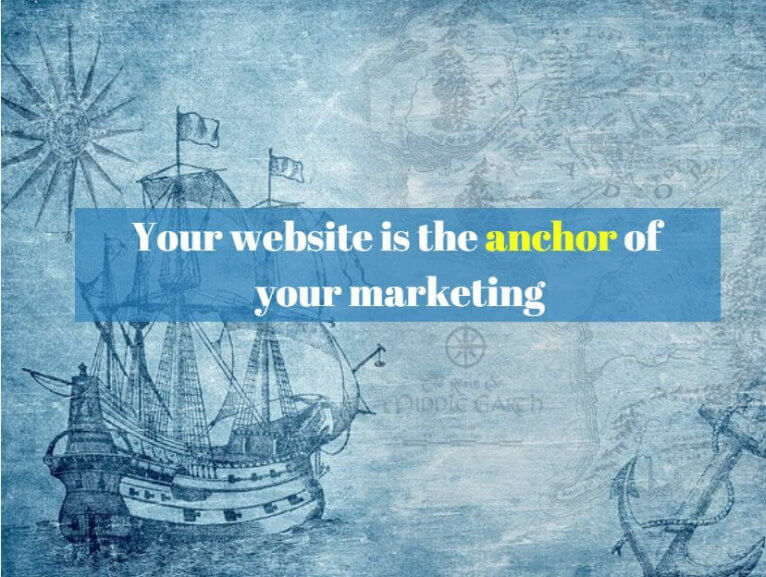 Your company’s website will be like an anchor for all of your advertising efforts. All your business details, all your services, all your products and promotions should be on your website first. Then you can create other marketing materials that drive customers to your website for additional information. How many times did you search for a company online that you have done business with before just to find the address details, the opening hours or a number to call to make an appointment or get extra information. I’m amazed that business owners spend tens of thousands of dollars to buy a fancy car for an image, but are reluctant to spend few thousands to get a professional website that people see every time online when they search for their business name. Often your website is the first thing that people to see, not your fancy car. And first impressions count and they’re often impossible to erase. A website is more than a giant public bulletin board where people can find things about you. A functional website can allow you to communicate with your customers. They can ask you questions, concerns, feedback, leave reviews and even give you suggestions about what services interest them more. This give you an option, as a business owner, to focus on how you can create more business value for them. A professional website is a marketing tool that costs you ONE TIME and continues to pay you back. It allows you to get more clients, improves your marketing and puts your business online where anyone can find you 24/7. Contact us if you need help with your website. If you are a small business owner (or you’re just starting out), you may think there’ no benefit in having a website when you can do on Social Media. Or you may decide to save money and get a freebie and do it yourself. Or maybe you have an established business that has relied on word of mouth and think that you are doing quite well. We are planning to write a series of articles about why your business needs a website so we don’t have a huge blog article. More and more people are searching online for things they want, for solutions to problems or for information about a restaurant, a business or a store. If you don’t have a website, potential customers will go to your competitors who do, especially if you are a home-based business. I am still amazed that in 2018, almost half of businesses don’t have a website! The recent Telstra Small Business Intelligence report found that 83% or customers believe using a search engine is very important to search for a business and still more than half of small business owners decide to have one. 47% of customers under the age of 40 report using a search engine to find (or research) a small business at least once a day. Let’s face it, we live in a word where we “Google” before we buy almost anything, review sites using Yelp and we “check-in” via Facebook. Beginning with your website, consumers are passing judgement and making a decision whether or not they will even call you (rather than visiting your store, restaurant or office). They are likely to dismiss you entirely if they think that your website doesn’t reflect the kind of experience your business should offer. If you don’t have a website, you are missing opportunities for customers to identify who you are and if they want to spend money with you. Having a D.I.Y freebie website is better than having a website at all, but is it providing the professional image you desire for your brand? Sometimes having a bad website can be worse sing it literally makes your business look bad. That’s nothing less professional online than a website that looks that was design by a kid in his 5th grade as a school project! Businesses invest in flyers and other marketing materials and completely disregard the way the website looks. Where you are a solo operator, or you have a team of 100 people, your website should appear as if you have a dedicated team to keep your online presence strong and noteworthy. For most small businesses, it is not necessary to update your website every day. However, having a professional website, that offers customers easy navigation, professional quality content and overall experience that engages them enough to do business with you is the key. With careful planning, a functional website designed with your customers’ needs in mind can provide a professional image that your business needs to grab the attention of the visitors. In our next article, we will cover more reasons why your business needs a website. Until then, work on your online business presence! You contact us to do a free health check on your website to give you suggestions of what you can do to improve it. The “Pomodoro technique” is a management methodology developed by Francesco Cirillo in the 1980’s. It a nutshell is focusing 25 minutes at a time on a single task in order to get the todo list’s jobs from done. Pomodoro means “tomato” in Italian and it was inspired from a tomato-shaped kitchen timer used by Francesco to track his time. Because already more than 2 million people have already used it to transform their lives, making them more focused and more productive. This technique allows you to focus on one task at a time and not getting distracted by everything else that is happening in your life. Being focus rather than reactive. #1. Split the tasks you work each day into short 25-minute parts (‘pomodoros’) and focus your attention on what needs to be done for only a task, manage distractions better. All you need is a pen, a piece of paper and a kitchen timer. #2. While working on a longer task, between those ‘pomodoros’ use small 5 min breaks to help your ability to concentrate on the task. The breaks allow you to return to the task with fresh eyes. And it also stops procrastination as you’re working in short bursts and stops the tasks feeling overwhelming. It also helps you estimate the duration of the tasks that you want to get done. On my downloadable version of Pomodoro sheet you can see the Effort column. This will help me improve my estimates for future similar tasks. It’s important to complete a Pomodoro before taking a break. 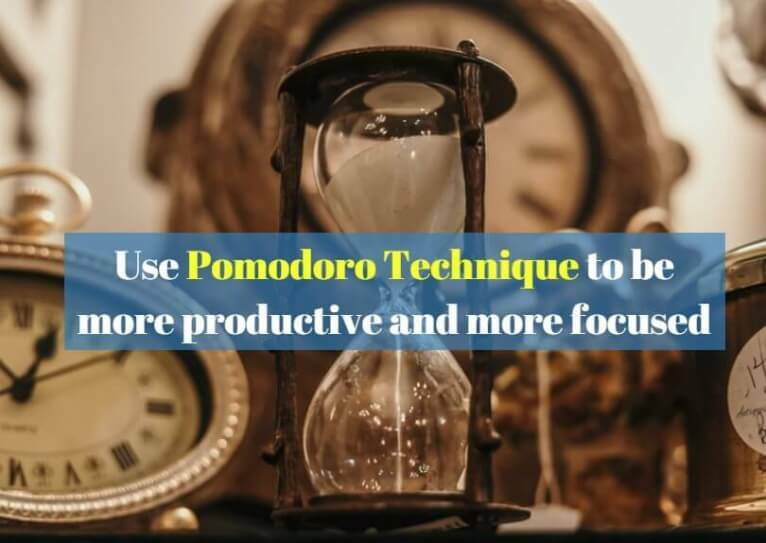 Ideally, if you remember that you need to do something, stop for a second and add that task on the Pomodoro Sheet, and keep on working on the initial task. If you are forced to stop what you’re working on in the middle of the Pomodoro, you just don’t record it. #3. After 4 Pomodors, you should take a longer break (10-30 minute). #4. Repeat the process until the task is completed. I also use a Priority method that I’ve got from Bryan Tracey’s book “Eat the frog!” to ensure that I will focus on the most important tasks and make sure those get done. Each task will get a letter A, B, C, D followed by a number (from 0-9) to know the order of the tasks that I need to work on. “E” – “eliminate” (whenever possible). So, for example, an A0 task is more important than an A1 task and it has to be done first. How to measure the Pomodoro technique? If you want to use the template that I’ve develop, click the link to download it. Do you use this technique? Or what other tools or best practices do you use to be more productive? Why do you need to create landing pages for your business? Landing pages are valuable marketing tools that can benefit your business. 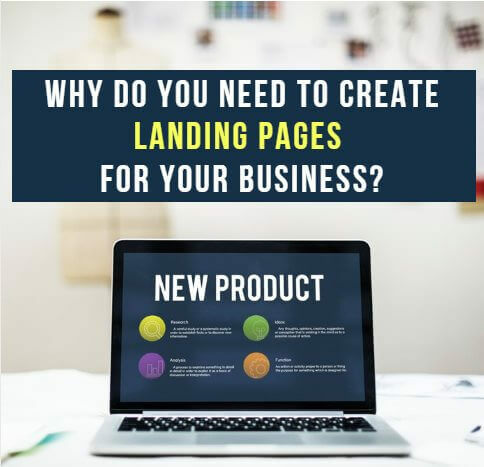 The reason of having a landing page is to provide people with a clear, direct call to action and to make it easy for them to buy your products, or subscribe to your list, or to contact you. Unlike other normal pages that sit on your website landing pages are great to educate your website visitors about your products or services and nurture them to act and press that CTA (call to action) button. Landing pages help your business to focus on a specific goal! Before you get started and ask your developer to build you a landing page you need to start with a goal in mind. Maybe you want to get more leads, so the purpose of your landing page might be to grow your list, or maybe you want to advertise a product or a service that you provide to your clients and you want to promote it and get more sales, whatever the case might be, start with the goal! If you want to get more conversion from people that visit your landing pages be mindful of who your audience is when you craft the content of the landing page. Instead of being too generic you might need to consider building multiple landing pages that target a specific portion of the audience. Headline: create a headline that grabs the attention of your visitors and entices them to stay on the page. Your headline is the first thing your visitors see when they land on your page. Make a great first impression so they stay and read on. Body: get rid of the fluff. Every work on your page that doesn’t represent your goal is a distraction that will dilute your message and reduce the conversion rate. Your message should be simple and to the point. Instil a sense of urgency in your copy so they can act right now. Use beautiful images: Invest in great images that convey the message that you want to transmit in your landing page. Call to Action (CTA): Have a clear CTA. Enhance the “look and feel” of your call to action to get more leads or more subscribers. Footer: include your contact information in the footer, so customers can contact you if they have any questions. I believe that you read reviews when you by anything online, don’t you? If you do, you know how important are the online reviews. 85% of customers trust online reviews as much as personal recommendations. Take advantage of the positive feedback you’ve received from your existing clients by including their testimonials or their Google/Facebook reviews on your website. Once you’ve designed and published your landing page, it’s time to start promoting it to your audience. Share the landing page URL as frequently as you’d like. Drive traffic from your social media channels to your landing page. Also, you might want to include it into your email signature or upcoming email campaign. Be strategic and use it in other marketing channels to your advantage. Have a plan to nurture the people who clicked the CTA of the landing page. Stay in touch with new subscribers and returning customers and provide a personalised relevant content. Reward them for their action and treat them as VIP. Keep the conversation going and introduce them to your business through automated welcome series of messages. Landing pages are a great way to connect with your audience and drive conversion, more signups and more sales for your business. Need help creating a landing page that can get more clicks, more signups and more sales for your business? Let’s have a chat! What is GDPR? And what should I care? The hot topic that is talked today, especially if you are living in European Union is around the General Data Protection Regulation (GDPR). I tried to find some articles online that can explain this in plain English and see how this regulation is affecting small businesses in Australia that don’t have an audience in Europe. And the most important thing, what do we need to do to be compliant and avoid the fees (that could go up to 4% of a company’s annual global revenue or 20 million euros). And the short answer is YES (if you have visitors from European Union countries). The latest WordPress release 4.9.6 is GDPR Compliant. But in order that your website to be compliant there is some work to be done because is more than likely that you have some plugins that store or process data like analytics, contact forms, membership sites, etc. 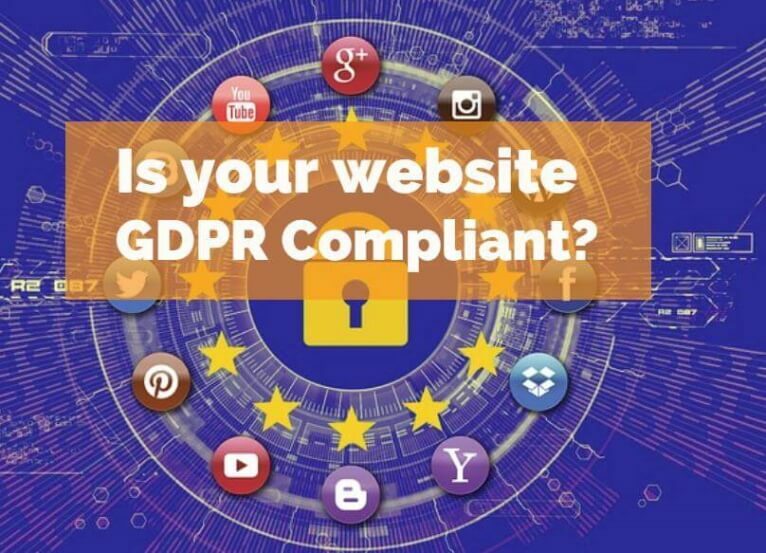 So please check with your developers to see if your website is GDPR compliant and if it’s not, work towards compliance and get it done asap. We are not lawyers. Nothing on this article and nothing on this website should be considered legal advice. If you want to be safe, it’s best to consult an internet law attorney to derermine if you are in compliance with all applicable laws for your case. Dorin – your friendly web developer! The rapid development of smartphone over the last 10 years changed the how people are searching for products and services. 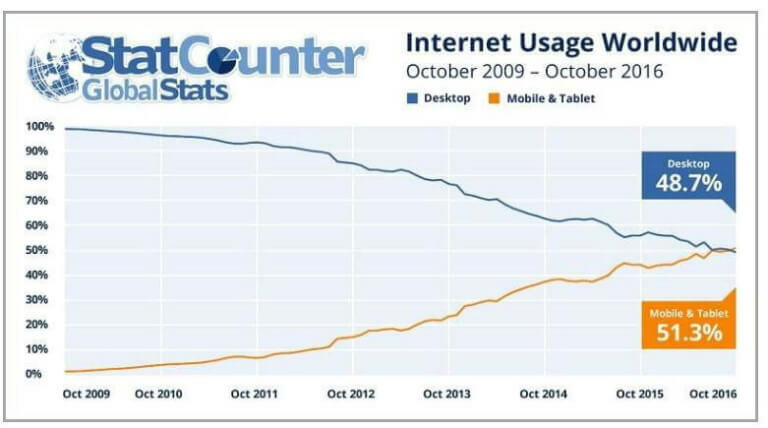 According to the stats found by StatCounter since 2016, mobile and tablet internet uses exceeds desktop usage worldwide. In fact. Mobile accounts for 71% of total online time in the U.S. Convenience is the first reason of finding things online using a smartphone or tablet. But not all users are action-oriented searchers. Some of them are using their phones just to browse Facebook or Instagram or to play some online games. Stats are showing that 9 out of 10 searches are a smartphone search. 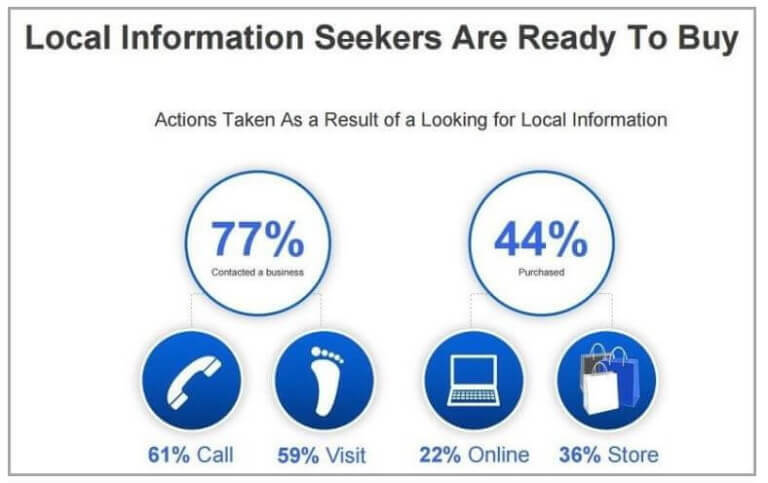 And out of those searches, 95% of users are looking for local information. Ok, so why is important that your website should appear in their searches? 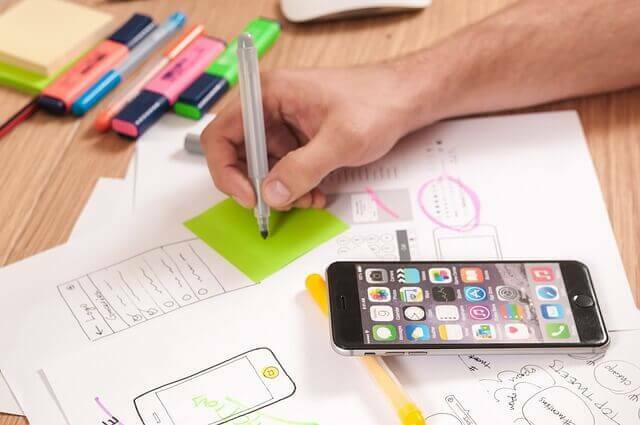 Because a great number of users are ready to buy, as the mobile users take different actions after accessing the online content, so the business owners should focus to create conditions to satisfy a mobile user needs in order to get the sale. If you don’t have your website optimised for mobile devices yet, you’ll need to rectify this mistake right now! Here are some ways to maximize the look of your website to mobile users and to increase your traffic. What is a mobile-friendly website? It’s a site that has a design that reacts to the size of the device used, that automatically displays the correct layout and adjusts his content to fit the screen. Another ranking factor is the page load time of your website. AMP is a Google-backed initiative that makes the pages to load more quickly. The AMP framework is open source, available to everyone and free. So if you want instant loading, increased conversions you might want to use AMP when you’re building your website. You want to help visitors to get things done when they are accessing your website. Add search boxes on the homepage, links to your nearest store locations, product searches, reviews etc that allow them to get the things done fast. There is nothing more frustrating than a poor navigation for your website. Users that are coming to your website and don’t have a nice user experience are likely to click somewhere else. 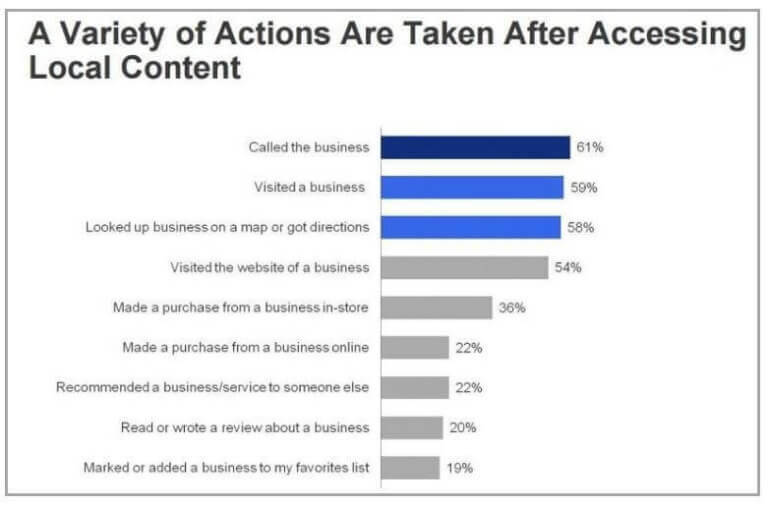 Think about the mobile users when you’re building the content to your website. Is the information visible without too much scrolling? Also make sure that the links (buttons, or other Call to Actions) are placed at a distance from each other as the users are going to use their fingertips to click them. Design your website for touch: add drop-downs instead of unnecessary typing, as typing on a mobile device is time-consuming and inconvenient. Use Social media channels to attract visitors to your website. Promote your website on social media profiles to increase your number of potential customers. Have like and share buttons on the content of your website or blog articles. It’s worthwhile to invest the time in optimizing your website to improve engagement and increase profits. 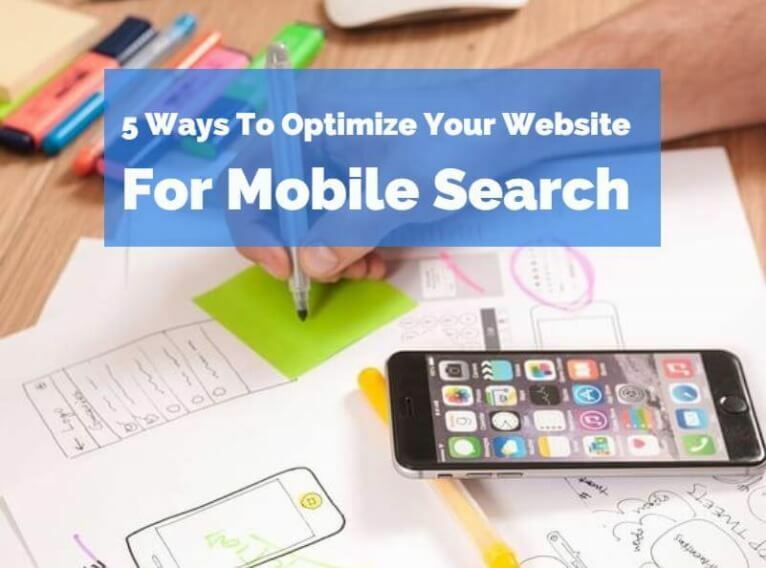 Don’t waste your time and start optimizing your website to make it more mobile-friendly. Contact us if you need help improving your website so you can attract mobile customers and increase your profits considerably. When was the last time when you wanted to check a service or download a free ebook from a website and you were not sure if it’s worth signing up and giving your email address to be spammed for the rest of your life? You can read all the emails that are sent to this address directly on the page without needing to login to any inbox. You can also reply to the sender by clicking a button. In the past, you could even forward this email to your good current address, but this functionality is temporarily closed because of the abuse. Do you want to use government funding to be more competitive? Are you a Queensland based business? Hurry up and use this opportunity to apply for up to $10,000 digital grant program! 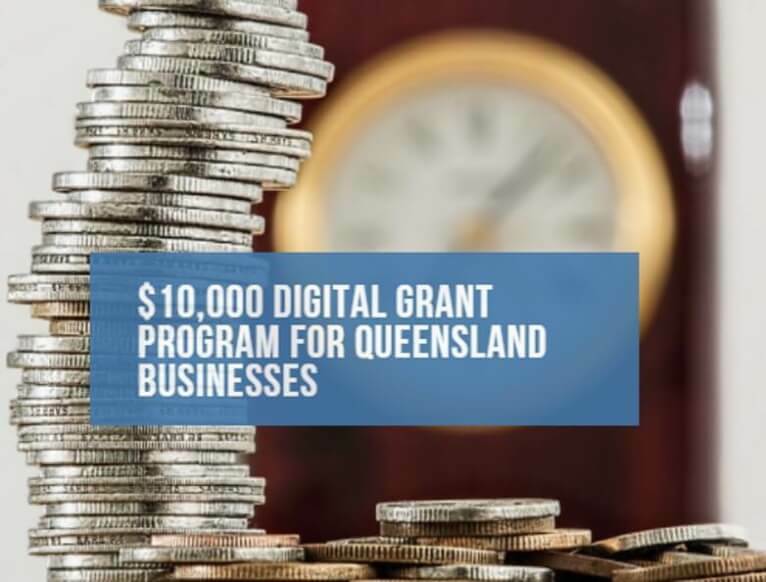 Matched funding of up to $10,000 (excluding GST) may be provided to eligible businesses for the purchase of hardware, software and services (such as digital coaching). The minimum grant funding is $1,000. The business must show that the digital technology or service purchased and adopted will enhance the digital capabilities of their business and help them to be more competitive and employ more staff. Payment will be made directly to the business on completion of the project and on presentation of proof of payment for the product or service. Round 4 is now open and closes on 11 April 2018 at 5 pm. We had clients who benefited from this grant last time it was open so they could use the money building things that were very important for their business. If you’re interested schedule a meeting with me and I’ll suggest ways to make the most of the grant. 6 Reasons why an online presence is crucial for your small business. Why should you focus on creating an online presence? Running your own business is no easy task and your to-do list is guaranteed to never end however this should not be an excuse to take shortcuts when it comes to having an online visibility. 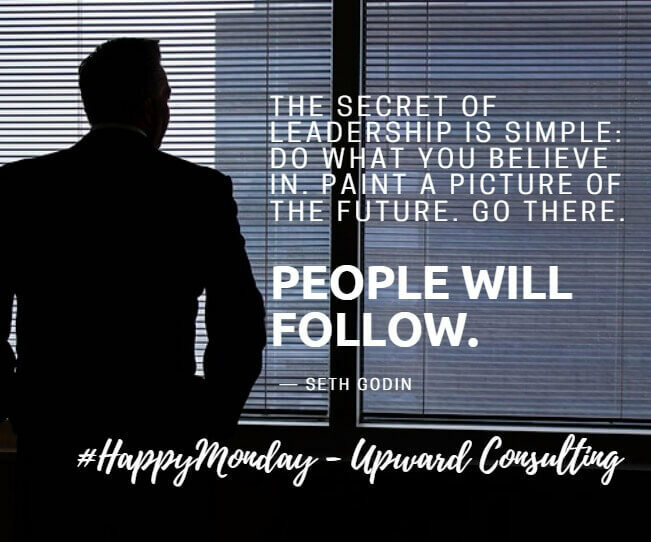 This is especially important if you want to increase your brand awareness, grow your leads, boost your sales, engage with your clients and make them raving fans. The reality is that you can’t get away without having an online presence. First impressions count and in order to appear professional to your clients it is important to have a well designed, functional website. A few years ago, based on a survey done by the Australian Bureau of Statistics it was revealed that out of 6640 businesses in Australia 47.1% of them still have no website. 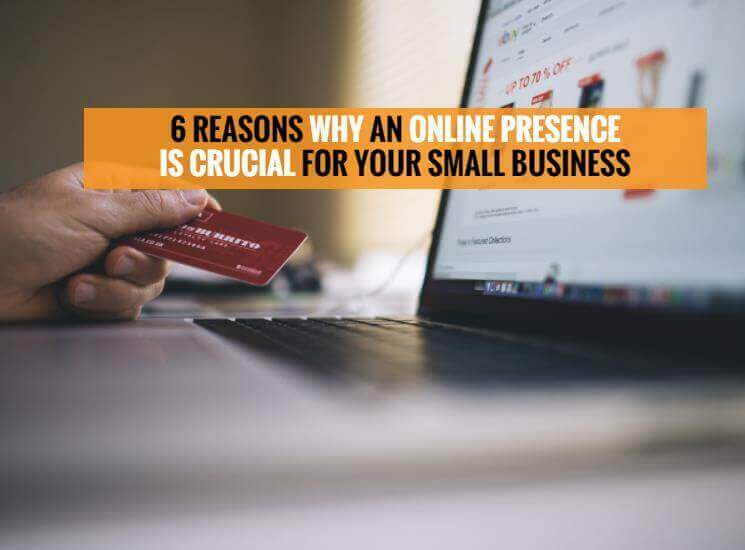 Here are 6 reasons why an online presence is crucial for your small business. It is worth the effort to invest money in your online presence both on the website and Social media as it is much less than spending on printing out flyers, brochures, billboards or other marketing collateral. Companies spend millions creating brochures and distributing them. Even though you meet potential customers through networking and personal connections, they will want to check your website to see if you are a legitimate business. You don’t need to convince them that you are the real deal. Having a well-structured functional website can give instant credibility to anyone. Moreover, having a website also gives you a pretty good idea of how many visitors you have each month in comparison with how many people have seen your flyer or brochure. Finally, a website allows you to change campaigns quite rapidly by uploading images effortlessly without having to throw away the printing marketing material that is no longer relevant to your business. Your business is open 24/7 all year round for anyone that wants to connect, get inquiries or sales requests without you having to do a lot of marketing effort. It doesn’t require your supervision or the need to lock it up. You can always be there for your customers. A website with an online ordering form, a shopping cart, or an inquiry form will prompt clients to purchase your goods or use your services from the comfort of their home or office, or even while they are waiting for their bus. Having a professional website allows you to boost your branding. This is true for websites that have a good user interface and invest the time thinking of their clients and the experience they are having when they visit those particular websites. Owning a website allows your clients to easily reach you, or found more information about your products and services. You can also send newsletters or other notifications to your subscribers instantly. Plus you can answer their questions with the help of anFAQ page. This is impossible with poster letters. Having a blog or just a Social Media feed on your website can update your customers on your new offers, products, promotions, events or any other content. A website allows you to do a quick market research, pools, surveys, etc. to see how your products or services are doing on the market. With a website, your contact details are always a click away, making easier for any potential clients to reach you. If you want us to review your existing website or you need to have a brand new professional website built let’s schedule a meeting. Dorin is an exceptional web designer with a keen eye for the end user experience. He works tirelessly to ensure his clients are continuously improving upon their Google presence, and in turn improving their business success. Thanks Dorin!